Schizophrenia - body, causes, What Is Schizophrenia?, What Causes Schizophrenia? Schizophrenia (skit-so-FRE-ne-a) is a serious mental disorder that causes people to experience hallucinations, delusions, and other confusing thoughts and behaviors, which distort their view of reality. "… why will you say I am mad? The disease had sharpened my senses—not destroyed—not dulled them. Above all was the sense of hearing acute. I heard all things in the heaven and in the earth. I heard many things in hell. How, then, am I mad? Harken! and observe how healthily—how calmly—I can tell you the whole story." Poe's short story features a narrator who deals with the symptoms of a serious mental disorder called schizophrenia. He hears things (in the end, the beating of a dead man's heart) that others do not hear, and he believes that people are out to get him. His thinking is distorted, and he has lost touch with reality. Schizophrenia is one of the most severe and disabling of all mental disorders. People with this complex and often-misunderstood condition experience hallucinations * , delusions * , and other confusing thoughts and behaviors, which distort their view of reality. About 1.5 million people in the United States have the disorder. The term schizophrenia comes from Latin and means "split mind." The minds of people with schizophrenia cause them to have periods when they are unable to separate the unreal things they see, hear, and think from the real world as it exists for most people. Many people incorrectly believe that having schizophrenia means that a person has many personalities. However, there actually is a separate mental disorder, called multiple personality disorder * , in which a person goes back and forth between two or more distinct identities. Schizophrenia is a different condition. With proper treatment and the support of family, friends, and mental health professionals, people with schizophrenia have a better outlook today than in the past, when many were condemned to mental hospitals where they often were mistreated. No one is sure what causes schizophrenia. It runs in some families, and a person whose parent has the disorder has a 10 to 15 percent chance of developing schizophrenia. This suggests that genes * play a role, but one identical twin may develop schizophrenia, while the other who shares the same genetic makeup may not. Many scientists think that genes put some people at risk for schizophrenia, but that other factors in the person's life trigger the symptoms. Other studies suggest that neurotransmitters * in the brains of people with schizophrenia are not working properly. Neurotransmitters are chemical substances that help nerve cells communicate. An imbalance of neurotransmitters seems to cause the nerve cells to send the wrong signals. This might explain the hallucina-tions and distorted views of reality that people with schizophrenia have. Schizophrenia often begins in the late teens and early twenties for males, and the twenties and thirties for females. Children as young as five can develop schizophrenia, as can older men and women, although such cases are rarer. The first signs often are hard to recognize. People might withdraw and experience trouble with school, work, or social relationships. Attention to personal hygiene drops. Thinking and talking become disorganized. People might start displaying inappropriate facial expressions or emotions, such as laughing at a tragedy. Of course, just because people act this way does not always mean that they are developing schizophrenia. * genes are the hereditary material that helps determine many physical and mental characteristics. * neurotransmitters are chemicals that carry messages from the brain to other parts of the body. These positron emission tomography (PET) scans are computer-generated images that show how the brain is functioning. 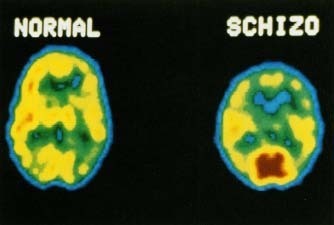 Compare the brain activity in a healthy person (left) to that in a person with schizophrenia (right). The red area in the brain on the right shows intense activity by tiny particles with a positive electric charge, called positrons. NIH, Science Source/Photo Researchers, Inc.
really there. Sometimes the voice comments on the world or the person's thoughts. Other times, the person hears two voices arguing or someone saying to do certain things. In addition, people with schizophrenia often hold irrational beliefs. Some become paranoid * , which means that they falsely believe that other people are out to get them or that they are very important. Paranoid people may think that the police are against them, that outside forces are controlling their actions, or that people are always talking about them. Other people with schizophrenia become catatonic * , which means that they show extreme disturbances in movement. Catatonic people may sit rigidly, staring at nothing, and not reacting to things around them. In some cases, they may engage in pointless motions. * paranoid (PARE-a-noyd) refers to behavior that is based on delusions of persecution or grandeur. People with persecution delusions falsely believe that other people are out to get them. People with delusions of grandeur falsely believe that they have great importance, power, wealth, intelligence, or ability. Psychiatry is the field of medicine that deals with the study, treatment, and prevention of mental disorders. The field was still in its infancy during the nineteenth century, but it underwent a revolution around the turn of the twentieth century. Progress in other areas of science, such as the study of the brain and nervous system, increased scientific interest in how physiological problems might be related to psychological states. One scientist who was drawn to this question was German psychiatrist Emil Kraepelin (1856-1926). While developing a classification system for mental illnesses, Kraepelin defined dementia praecox as a major form of psychosis, a serious mental illness that leads to thoughts and behaviors that are out of touch with reality. The Swiss psychiatrist Paul Eugene Bleuler (1857-1893) later refined the concept of dementia praecox and renamed it schizophrenia. 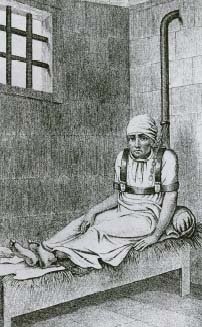 Throughout history, mental patients often were treated as prisoners. This drawing was made in 1812 in Bedlam, the popular name for the Hospital of St. Mary of Bethlehem, a famous "insane asylum" in London. Today the word "bedlam" is used to describe any place that is the scene of uproar and confusion. Mary Evans Picture Library/Photo Researchers, Inc.
By the time a person with schizophrenia experiences hallucinations, it is obvious to family members and friends that something is very wrong. Even the person with schizophrenia might sense during clear moments that there is a serious problem. Before diagnosing the disorder, a physician first makes sure that nothing else is causing the symptoms. Some viruses, drugs, and poisons can cause a person to experience schizophrenia-like symptoms. Hospitalization often is necessary, at least at first. Antipsychotic drugs * can reduce or stop the hallucinations and disorganized thoughts and speech. Psychotherapy * can help people with schizophrenia and their family members cope with the disorder. With proper treatment, one third of schizophrenia patients can expect a significant and lasting improvement, one third will improve but will have some lasting symptoms and periods of relapse, and one third will remain severely and permanently affected. * catatonic (kat-a-TON-ik) refers to an extreme disturbance in movement that has a psychological cause. Catatonic people can develop a wide range of symptoms, including becoming very inactive and withdrawn, displaying excessive activily with no purpose, refusing to talk or follow instructions, becoming rigid if others try to move them, adopting strange gestures and facial expressions, and repeating the words or copying the movements of others. * antipsychotic drugs are medications that counteract or reduce the symptoms of a severe mental disorder such as schizophrenia. * psychotherapy involves talking about feelings with a mental health professional. The therapist can help the person change thoughts, actions, or relationships that play a par in the mental disorder. Torrey, E. Fuller, M.D. Surviving Schizophrenia, third edition. New York: HarperPerennial, 1995. A comprehensive and understandable overview of the disorder. U.S. National Institute of Mental Health, 6001 Executive Boulevard, Room 8184, MSC 9663, Bethesda, MD 20892-9663. A government institute that provides information about schizophrenia. American Psychiatric Association, 1400 K Street Northwest, Washington, DC 20005. An organization of physicians that provides information about schizophrenia. National Alliance for the Mentally Ill, 200 North Glebe Road, Suite 1015, Arlington, VA 22203-3754. A self-help organization for people with serious mental illness and their family and friends. I would just like to add that everthing on this page is quiet correct because i have someone in my life who suffers this from this and it all connects to him !! !